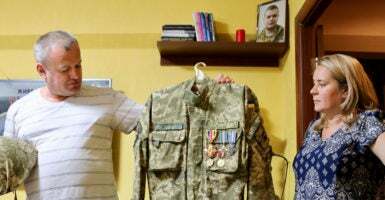 ZAPORIZHIA, Ukraine—The last time Marina Kasyanenko saw her son, Daniel, she begged him not to return to war. 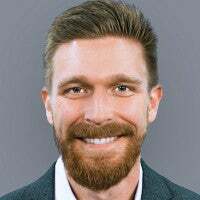 It was July 2015, and Daniel had gone home to his parents’ apartment in the Ukrainian city of Zaporizhia on convalescent leave. A mortar blast in a battlefield trench in eastern Ukraine had left him with a severe head injury—a “head contusion,” as the army doctors called it. One day, as Daniel napped on the couch, Marina quietly regarded her son. She put a hand on him as he slept. Daniel was tanned from the summer on the Ukrainian war’s front lines in Pisky. His hair was cut short, as was his habit, and his hands were rough and calloused, with dark spots left behind from healed cuts and scrapes. Sleeping, he was like the boy she remembered. But, when awake, Marina could fully take stock of how much her son, her only child, had changed after going to war. There was a particular conviction, now, in the way that Daniel talked and carried himself that hadn’t been there before. Also, there was a sort of sadness in the way he talked about the war, or avoided talking about it. A change from the teenager who had liked American action movies and whose dream it was to be in the U.S. Army. Now, there was a 19-year-old man who worried that he was too young to have gone to war, and that his soul might be ruined forever by the things he had seen and done. “Is killing in war, murder?” Daniel had wondered aloud on the front lines. There were also intimations of a resigned fatalism in the way Daniel talked about his chances of surviving the war. Daniel wasn’t religious, but he kept a white Orthodox crucifix around his wrist while in the trenches. And he kept a letter written by an elementary school student tucked into his body armor for good luck. Daniel had no lack of conviction about what he was fighting for. It was simple—to defend Ukraine from a Russian invasion. But he also understood that the justice of his cause did not automatically mean his enemies were evil people, although it’s easy for a soldier to think that way. Daniel considered that some of those faceless enemy soldiers shooting at him every day were probably young men like himself, fighting for a cause they believed in. 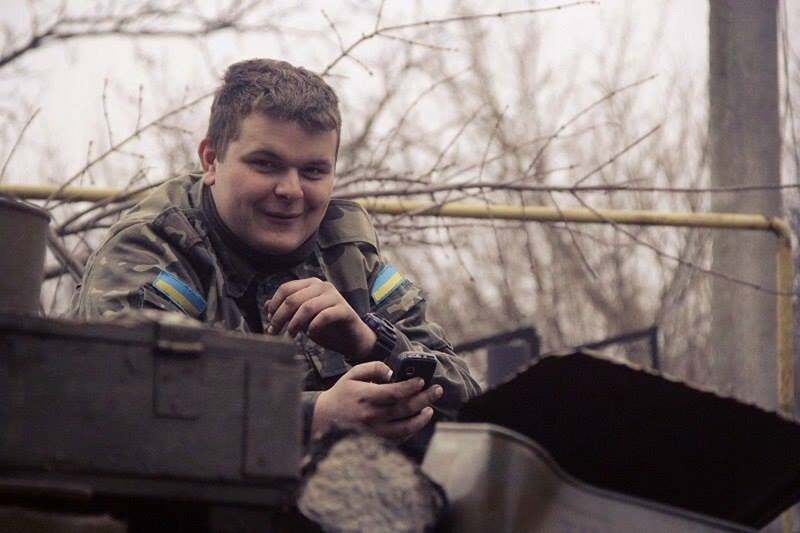 That kind of moral relativism toward Russia’s proxy army in eastern Ukraine surpassed the battlefield wisdom of Ukrainian soldiers more than twice Daniel’s age. And even my own—at that time a 33-year-old conflict journalist whose job it was to remain objective in war. For my part, I struggled to soberly consider the intentions of the snipers trying to kill me in the way that 19-year-old Daniel was able to. In the weeks he was at home to convalesce in July 2015, Daniel was left with a ringing in his ears and he had eyesight problems due to his head injuries. His mother offered to take him to see a doctor. He demurred. And, recognizing the other, invisible ways the war had wounded her son, Marina also offered to take Daniel to see a psychologist. He didn’t want to do that, either. 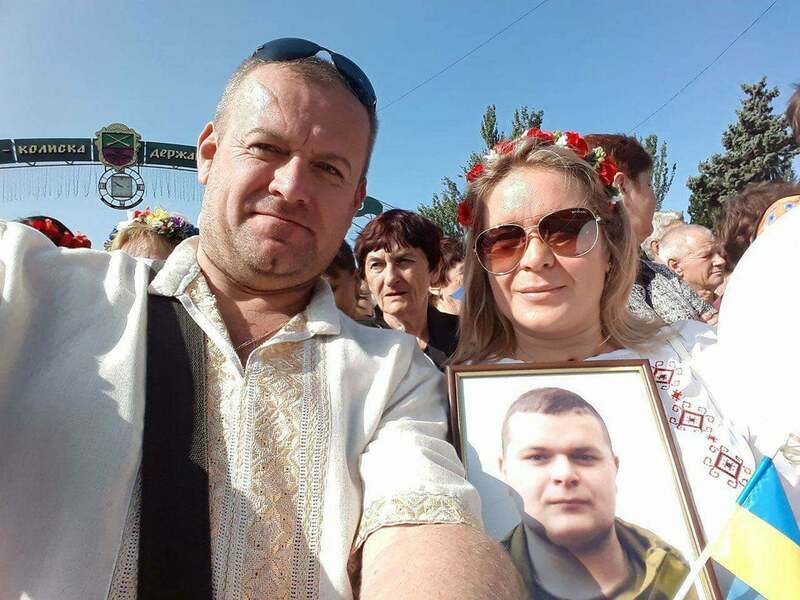 Marina and her husband Konstantin, Daniel’s father, proposed to their son that he should rejoin the local self-defense battalion in Zaporizhia. 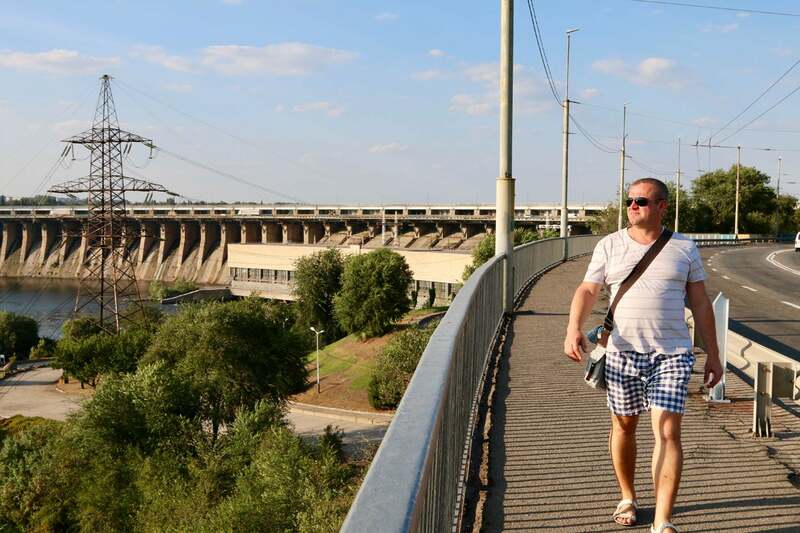 Daniel had been a part of the civilian unit the year prior to fend off a separatist uprising in Zaporizhia during the opening weeks of the war. But the conflict was no longer a street fight against Russian-backed thugs. It had become a trench war with artillery, mortars, rockets, and tanks. Daniel was still a volunteer soldier with no contract. He could leave the war whenever he wanted. He didn’t have to go back. But, no matter what Marina and Konstantin said, Daniel was intent on returning to the front lines. So, rather than push their son and potentially send him back into combat on bad terms, the anxious parents decided they could at least buy Daniel some new clothes and other things before he headed back to the trenches. They took him out shopping for new military fatigues, special shoes, and a watch. Before Daniel left, Marina tried one last, desperate time to get her son to change his mind. Yet, the inescapable gravity of war had Daniel firmly in its grasp. There was no question about it; he had to go. He did. And he was gone forever. Daniel, as a boy, was fascinated in the kinds of things most young boys find fascinating—like dinosaurs and outer space. As he grew older, Daniel began to read more and more books about weapons and the military. And he “adored” American action movies, Marina says. By the time he was a teenager, it was Daniel’s dream to be a U.S. Army soldier. Yet, Daniel had a quiet contemplative demeanor, which bespoke nothing about his military aspirations. He wasn’t aggressive, competitive, or one to raise a ruckus. Early intimations, Konstantin says, of Daniel’s philosophical nature. Daniel finished middle school at the age of 15. 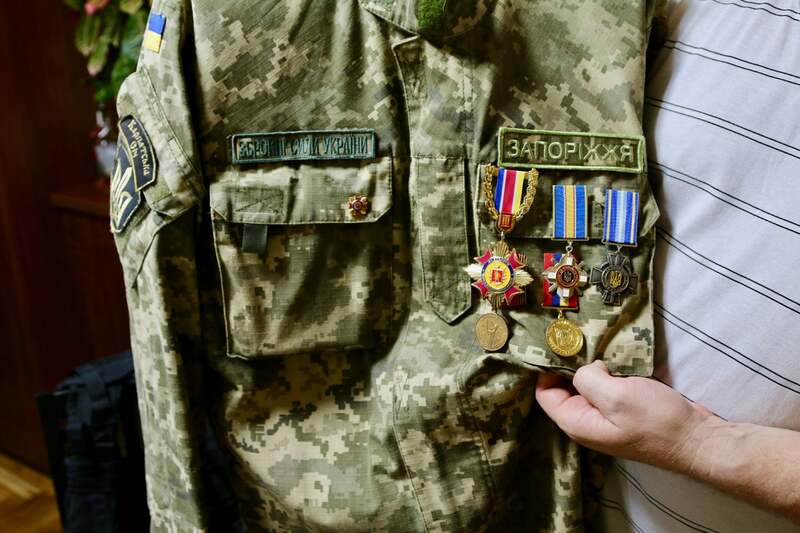 Put off by the Soviet mentality lingering in Ukraine’s military academies, he decided to become an electrical engineer, not a professional soldier in Ukraine’s armed forces. His budding life plans were put at bay, however—as they were for many people of his generation in Ukraine—when, during the winter of 2013 to 2014, pro-European protests in Kyiv swelled into a revolution calling for the ouster of Ukraine’s president at that time, Viktor Yanukovych. Daniel traveled to the capital city to join the revolution. “He always had to be the first to go.” Marina says, recalling that time with an exasperated smirk and shaking of the head. After the revolution, Daniel joined a territorial self-defense battalion in Zaporizhia that stood guard over City Hall to defend against a Russian-sponsored separatist movement steamrolling across eastern Ukraine at that time. Then, as Russia’s separatist project escalated into a full-on war, Daniel heard the siren call of fulfilling a childhood dream. In the late spring of 2015, Daniel set off for the front lines in Pisky as part of the Karpatska Sich volunteer battalion, one of dozens of civilian volunteer militias that had formed in the wake of the revolution to counter Russia’s proxy invasion of eastern Ukraine. Marina tried to convince Daniel to stay back from the front lines until he could get some proper military training. Ultimately, however, the entirety of Daniel’s combat tutelage occurred on the front lines in Pisky—what soldiers there jokingly referred to as “natural selection” training. What Daniel found on the front lines in eastern Ukraine was a far cry from standing guard against hired thugs outside Zaporizhia’s City Hall. The war was a trench battle against Russian artillery, tanks, mortars, and rocket attacks. As well as the ever present, chilling threat of snipers. “It’s a real war,” Daniel had told me when I first met him on the front lines in June of 2015. “You have no second chance here,” he said. Daniel called his mom almost every day from the war. Usually, they didn’t talk about anything important. But he was a young man who had gone straight from living under his parents’ roof as a boy to living amid the death and danger of trench warfare as a young man. There was no basic training, no military academy, no time at a firing range, even, to serve as an interlude. It was like a jump cut in a film—straight from boyhood to war. And so, probably for both Daniel and his mother, those daily phone calls were a way to dull the trauma of skipping all those steps in between that make sending a child to war a little easier—if such a thing is even possible. When Daniel called his mom from the front lines on Aug. 6, 2015, it was a day like any other. But something Daniel said struck his mother as extraordinary. Amid the shelling, the mortars, the rockets, the tanks, the snipers … he was complaining about mosquito bites. “I thought how crazy it was that they were more worried about mosquitoes than bullets,” Marina recalls, shaking her head incredulously. Marina told her son to be safe; he said goodbye and not to worry. And that was it. It was 10 a.m. on Aug. 6, 2015, when mother and son last talked on the phone. Seven and a half hours later, at 5:30 p.m., a mortar killed Daniel. He died alongside one of his friends. For some reason, the next morning Marina didn’t check the Facebook page for Daniel’s unit, as was her habit every morning. 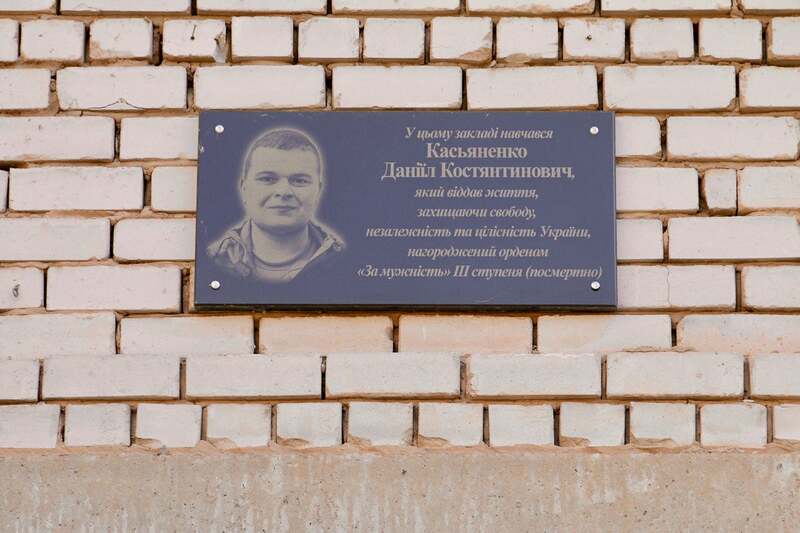 At 10 a.m., a soldier friend of Daniel’s named Andrey arrived at the door to the Kasyanenkos’ apartment. At the very first knock, both Konstantin and Marina feared something was wrong. They opened the door and there stood Andrey. “Are you Daniel’s parents?” he asked. “There is no Daniel anymore,” he said. There is no way for a parent to fully recover from losing a child. You can see that truth in the way the pain of losing Daniel is now, and may forever be, the bedrock to both Konstantin and Marina’s lives. The smiles, the jokes, the good times. That is all a thin veneer over the piled upon strata of pain and sadness that now reach straight down to the center of their souls. Marina was 20 and Konstantin was 21 when they married in 1995. Daniel was born a year later. They have hardly experienced adult life in any other way than being Daniel’s parents. As she speaks of her son, Marina’s eyes frequently well with tears. She keeps going, anyway, and finishes what she has to say. Konstantin, each time at the sight of his wife crying, stands and goes to the kitchen of their apartment, or into another room. He doesn’t proffer an excuse as to why, he just gets up and walks away. Maybe, you think, he’s too proud to cry in front of a guest. Especially an ex-U.S. Air Force pilot who was friends with his soldier son and had been in the war with him. But the more you get to know Konstantin, the better you understand that he isn’t trying to hide his sadness from you. He just brims with an uncontrollable feeling of helplessness when he feels the full weight of his and his wife’s pain. He has to do something. And so he stands, out of reflex. He moves in a direction, any direction, hoping that maybe there’s something, anything he can do to make this pain stop. To end his wife’s agony and the unspeakable quantity of regret that weighs on him for losing his boy, his only child. But there’s nothing to do. No action to take, other than to endure the unendurable. The moment passes. Calmed, collected, Konstantin comes back and sits down and takes a shot of vodka, and we go back to talking like before. One time, as Marina explains how Daniel liked to watch American action movies as a little boy—“The Terminator” and “Transformers” were his favorites—Konstantin stands up and walks away. A moment later, he comes back in the room carrying Daniel’s military uniform blouse. The chest of the blouse is covered in medals. A tag on the left breast says, “Zaporizhia,” and the Karpatska Sich unit patch is on the right shoulder. Konstantin stands proudly, holding the uniform. Sadness now morphs into a father’s beaming pride for a son who embodied the thing that every man secretly hopes he possesses—courage. Marina stands and then holds the uniform, too. Above and behind them, on the top of a bookshelf built into the wall, is a framed photo of Daniel. In it, he’s wearing that same uniform blouse. Wrapped around the picture frame, I recognize the white Orthodox crucifix that Daniel had kept tied around his wrist while in combat. These are the echoes of Daniel’s life. A picture, a crucifix, a military uniform. And there are other reminders, too. Like Dina, the Kasyanenkos’ 15-year-old dog, who still eagerly runs up to soldiers in uniform, probably thinking it’s Daniel. It takes about an hour to drive to the cemetery from the Kasyanenkos’ apartment. They don’t own a car so they have to take a taxi. They are only able to make the trip out to see where their son is buried a few times a year. War is a constant presence, endlessly woven into the tapestry of this land. The cemetery is near the airport, which was a Nazi air base in World War II. Adolf Hitler actually flew in there to visit the eastern front, Konstantin, a history buff, explains. German prisoners of war built the road on which we drive, he adds. Any cemetery, by its nature, is a solemn place. However, the reminders of the dead are particularly haunting at this one on the outskirts of Zaporizhia. 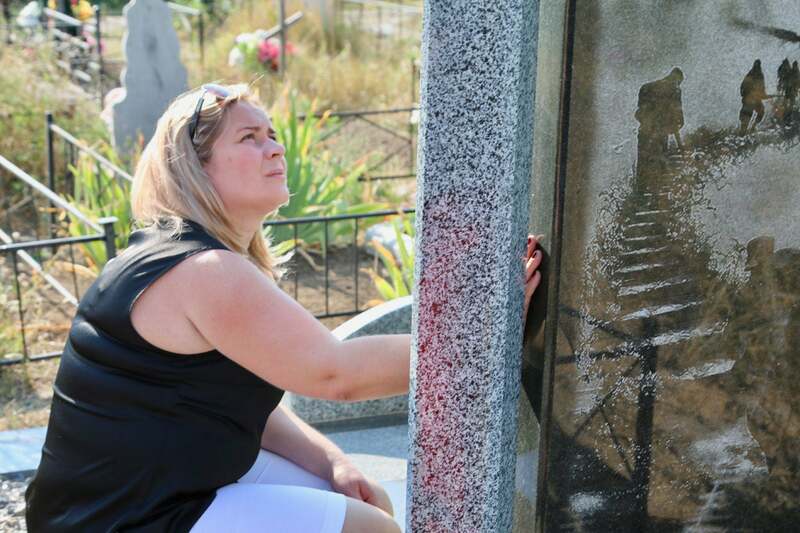 Ukrainians typically don’t just have headstones with the name and a few words about the dead. They also adorn the monuments with a likeness of the deceased—either a photo or an engraved portrait in the stone. Maybe, it’s an echo of the Soviet past. A chance to give the dead a degree of personal identity, a face, which was stolen from them in life. The taxi bumbles along an overgrown dirt road through the cemetery grounds. We turn right at a crossroads and park a little way up. We get out, and walk through the graves, which are packed so tightly together you only have about a 1-foot-wide path to walk on as you cut through the plots. Where there is not a grave, the wild grass has grown high, retaking the land. I see Daniel’s grave. His face, that same portrait from the photo on the bookshelf in the Kasyanenkos’ apartment, is engraved on a polished black stone tablet about 5 feet high, framed on the top and the sides by gray stone slabs. Sharply cut and exactingly laid down, it’s beautiful. Konstantin tells me the region’s governor paid for it. Marina steps into the slightly raised little plot, onto the gravel and stone over the earth in which her son lies. This gravesite is noticeably newer than the ones around it. She kisses the engraved image of Daniel on the tombstone. Then, she lightly runs her hand over the likeness of her son’s face. A vase of flowers at the foot of Daniel’s tombstone has overturned in the wind since the last time the Kasyanenkos were here. Marina reaches down to right it. She tidies the gravesite, wiping away a smudge of dirt from the glossy black stone. And then she kisses Daniel’s likeness again. You think of earlier, in the apartment, as she flipped through the photo albums of Daniel’s childhood. His round, smiling face. That picture of Daniel as a little boy, in the arms of a man in a monkey costume on the Maidan in Kyiv. Daniel was so scared, Marina had remembered, they had to force him to take the photo. At Daniel’s grave, Marina stands with Konstantin beside her. They look at the stone memorial to their son; their memories of him linger like phantom pains from an amputated limb. In the weeks and months after her son’s death, Marina went to church often. She prayed for Daniel. For months, she had no answer. And then one night she had a dream. Tears roll down Marina’s face as she tells the story of her dream. Konstantin, as is his habit, goes to the kitchen for something. 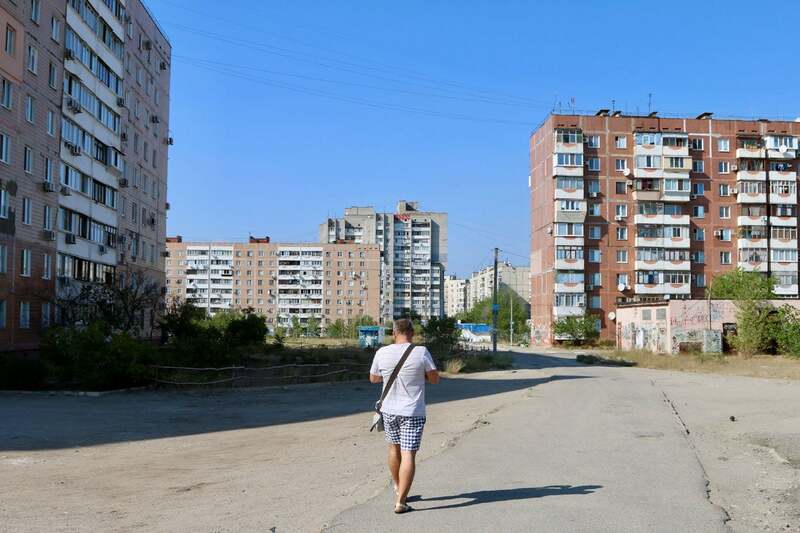 The Kasyanenkos live in a block of apartments in an area of Zaporizhia known as “the sands.” In Ukrainian, the word for “the sands” is “Pisky.” That’s also the name of the town in eastern Ukraine where Daniel died. At first, I suggest meeting at a café or a coffee shop to respect their privacy. But Marina and Konstantin insist I come visit them at home. The Kasyanenkos’ old Soviet apartment building is nestled within an urban landscape of overgrown curbs, split pavement, and paint-peeling facades. Yet, as is often the case in Ukraine, the interior of the Kasyanenkos’ apartment is the polar opposite of how it looks on the outside. Ukrainians have a habit of always taking their shoes off at the door, which is what I do as I enter. Inside, the apartment is pristine, modern, renovated with new furniture, fresh paint on the walls, and a clean, unscuffed floor. There’s a flat screen TV in the living room, and a computer with internet in the den. The central, main room, which is now the living room, used to be Daniel’s bedroom. They gave their son the biggest room in the house, Konstantin tells me with a smile, segueing into how noisy it used to get when he had friends over. There is a large L-shaped couch in the living room, and in the center, on this day, is a dining room table crowded with many trays of home cooked food and bottles of wine and vodka. A 16-year-old student named Anastasia Karabuta soon arrives. She is a student at Daniel’s old school, and she recently wrote a journalism profile on him as part of a local contest meant to honor fallen soldiers. Karabuta’s work took second place out of about 300 entries. For Karabuta, writing the story about Daniel made the war real for her in a way that it had never been before. Then, to the toasts. We’re soon at home in each other’s company. I have lots of questions, and the Kasyanenkos tell me all about their son. After lunch, we walk over to Daniel’s old school, where Karabuta is currently a student. Over the front doorway is a metal plaque, a memorial to Daniel. “They were so surprised that he became a soldier,” she adds. 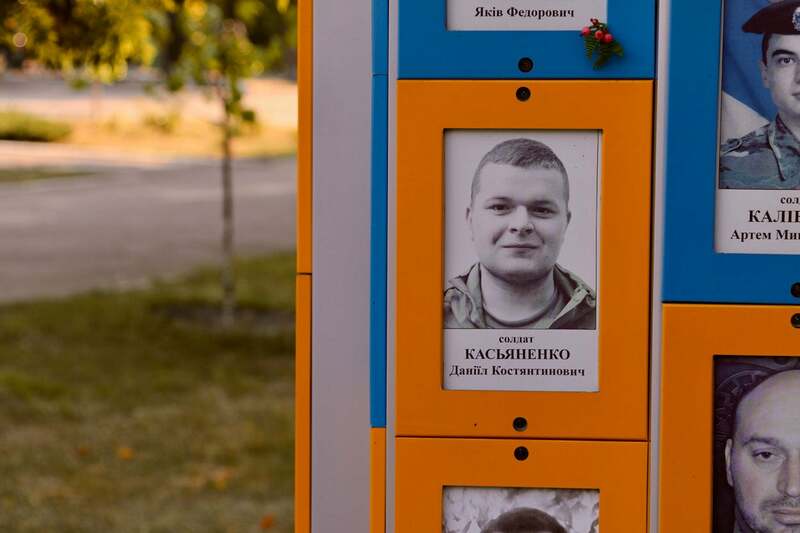 After the trip to Daniel’s gravesite, we visit a park in central Zaporizhia where there is a photo of Daniel within a collective memorial to all the region’s soldiers who have died in the war. More than three years and two failed peace deals later, the war in Ukraine is ongoing. More than 10,000 people have died because of it. Karpatska Sich, Daniel’s unit, was eventually incorporated into the Ukrainian regular army’s 93rd Mechanized Brigade. The move made Daniel an official soldier of the state. After he died in combat, his family was therefore afforded the financial compensation, and Daniel was awarded the military decorations due a regular army soldier. Daniel’s funeral in Zaporizhia was a public spectacle, underscoring the scope of the tragedy of his death. Crowds chanted and sang songs in Festivalna Square, at the foot of City Hall. Many cried as a team of soldiers carried Daniel’s coffin away. For the past two years, the Kasyanenkos had avoided other public events. It would be too hard, they had thought, too stark a reminder of the pain of their loss. On Aug. 24, however, Konstantin and Marina decided to attend a celebration for Ukraine’s Independence Day in Zaporizhia’s central Festivalna Square. Weeks later, I receive an out-of-the-blue phone call from Konstantin on a Saturday morning. He’s in Kyiv, just for the day, he says. There’s a ceremony to commemorate the third anniversary of the founding of the Karpatska Sich battalion, and he wants me to come. I agree, and 30 minutes later we meet outside the Kyiv City Council building on Khreshchatyk, the capital city’s central boulevard. Inside the main hall, the gathered crowd is arranged like a church procession in the high-ceilinged, rectangular space. Karpatska Sich banners hang from the arcade. The unit’s commander stands at a rostrum in front and leads the program. There are speeches and videos and photo slideshows and patriotic songs. Through it all, Konstantin beams with pride. Especially whenever photos of Daniel appear on the main screen behind the speaker’s podium, where a slideshow of fallen soldiers from the unit is on an endless loop. Then, unexpectedly, the unit’s commander begins a presentation of medals to family members of fallen soldiers. Konstantin stiffens when he hears Daniel’s name. At the commander’s behest, Konstantin walks to the front of the hall where he stands while the commander reads aloud Daniel’s accolades. Then, the commander presents Konstantin with a medal for his son’s courage in combat. A moment later, back beside me in the audience, Konstantin shakes my hand, his eyes welling, a broad smile on his face. He shows me the medal, his hands fumbling to open the box for a moment because they are still trembling. Afterward, we shake hands goodbye out on Khreshchatyk. I congratulate Konstantin again for the medal. He lights a cigarette and smiles. “Daniel deserves it,” he says.